Left foot forward (a journey into reenactment): Holding the Fort. Eastbourne. Land of foreign students and resentful local youths, fish and chips, a pier and a shopping centre, and a two hundred year old redoubt that was recently captured by the French. This was my fouth event with the 45eme and I remember when joining up first perusing the list of scheduled events for the year ahead and thinking 'well at least I'll be able to get to Eastbourne!' being only a 45 minute train ride and a walk. Gladly I have made many more events and I get the impression it is not uncommon for newcomers to soon realise that what might have been an occasional dip into history becomes a real drive. I certainly never expected to be travelling abroad to do it, at least not this year. Anyway, after the usual variety of pirate themed comments (it's the hat) from youths and more military related salutations from the elderly (there is not much in the middle in Eastbourne) I arrived at the Redoubt. It was much the same crowd as Dover, including the Foot Guards and Scots, it seems British regiments tend to be more localised whilst the French are more scattered, I suppose with more British groups people will gravitate to the nearest unit and the Foot Guards seem to be just that. Together we marched along the seafront and I had the honour of carrying the Eagle. Occasionally peeking up to see if it was facing the right way whilst not seeing anything on my left owing to the attached flag. Nevermind. Keep going. Look dignified. Chin up. On our return I was invited to fire a blunderbus by the 'Hands on History' stall. Goggles on and Boom! it went. 'I think something just stuck in my face' I nonchalantly thought whilst dabbing a finger on my nose. there was red stuff. I asked for a tissue. A bit of schrapnel from the case had hit me. They decided not to use those cases anymore. Dabbing at my nose/tache area in the bathroom however I noticed a glint of silver, a bit of it was still stuck in my face and I had to track down some tweezers (which apparently can't be kept in a first aid kit) and remove it. First injury! The chaps at the stall were apologetic and I later fired there cannon, It was a small matter and I expect things like that to happen occasionally, there is always room for the unexpected and the improbable, and whilst I hate to agree with Jeremy Clarkson on anything health and safety can often be a great tool in stopping anyone doing anything. Abit of drill followed in which I made the most obvious of errors in turning left when everyone else turned right, indeed I felt often just a moment behind everyone else as my brain processed the words. 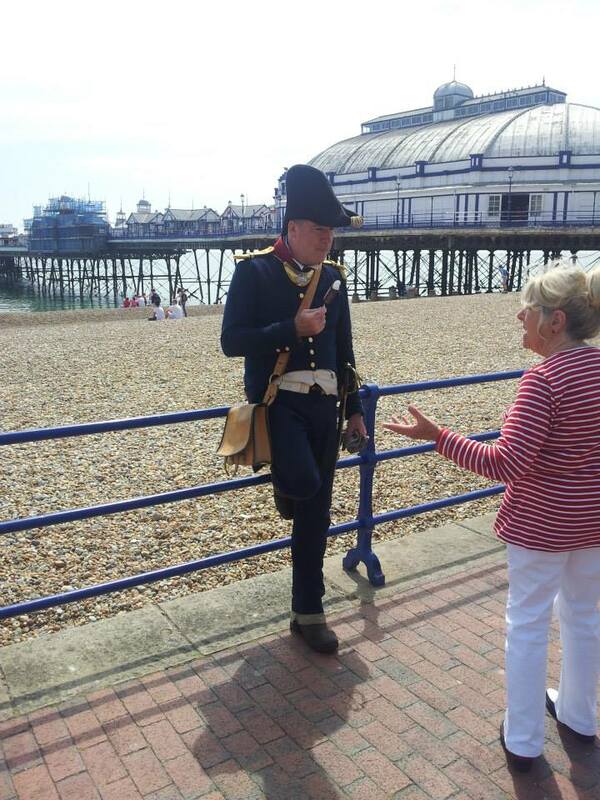 Then a lull so we had another jaunt along to the pier, heckling people to come along to the Redoubt! I confess I ate some non-authentic food when we all stopped for ice cream at the end (Officer's treat). You can't turn down free ice-cream. 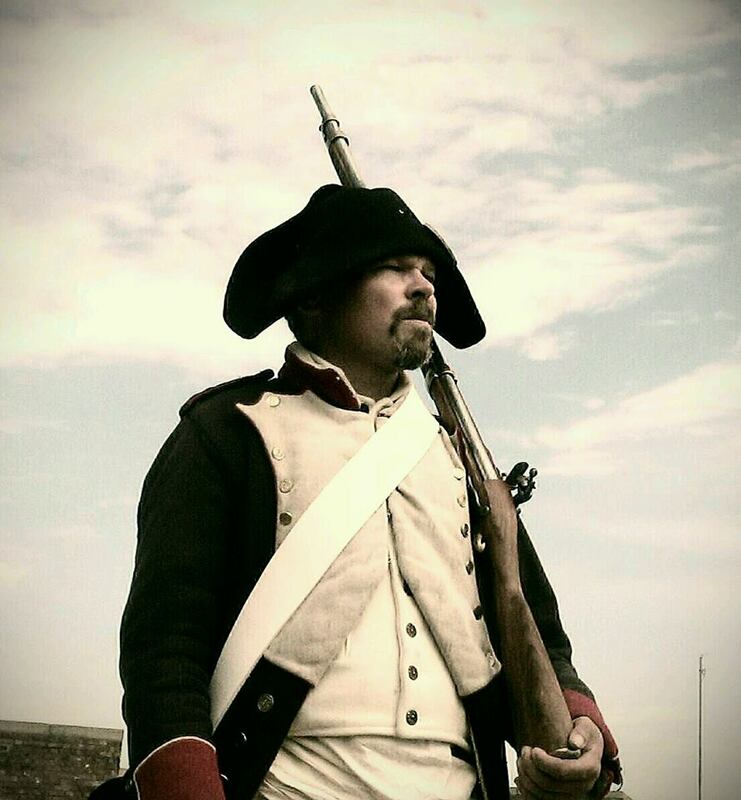 There were some great displays/events leading up to the skirmish that afternoon and much chatting with visitors, then as the time approached.. the heavens grew sullen and grey.. we brought the time forward half an hour and .. it absolutely poured down the very moment we stepped out. Fortunately no one was going anywhere so it was merely a pause. The wet conditions made a great effect on the smoke which drifted over the stones. Whilst volleys were fired myself and a few others scuttled about as skirmishers, the British were wittled down and forced to retreat up the stairs, I was rather pleased to run all the way round the top level and come up behind the last Scotsman standing.. who refused to surrender and was killed with his own bayonet. We all went out to The Belgium cafe that evening, which I highly recommend. Both for food and drink and good service, and a jolly time was had. Back at the Reboubt (yes, they let us sleep in it) we crashed out in our cosy entrance tunnel to the tune of the British singing rugby songs. My usual plan for discomfort (lying on flagstones) was kindly ambushed by the lending of a further blanket and a jacket so I made what looked rather like a doggy bed with a sandbag for a pillow. Next stop, Stanton St John Campaign weekend!